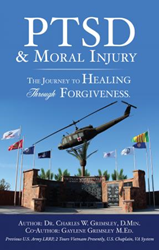 Dr. Charles W. Grimsley’s new book PTSD & Moral Injury: The Journey to Healing Through Forgiveness ($15.99, paperback, 9781498497626; $7.99, eBook, 9781498497633) focuses on the treatment of veterans diagnosed with posttraumatic stress disorder (war) trauma, to encourage inner healing of memories and achieve forgiveness, through a progressive journey toward healing. This book will help readers learn to cope and manage a life with PTSD and Moral Injury. PTSD and Moral Injury, while embedded in one’s unconscious mind, can lead to isolation and destructive behaviors resulting in hopelessness and helplessness. Xulon Press, a division of Salem Media Group, is the world’s largest Christian self-publisher, with more than 12,000 titles published to date. Retailers may order PTSD & Moral Injury: The Journey to Healing Through Forgiveness through Ingram Book Company and/or Spring Arbor Book Distributors. The book is available online through xulonpress.com/bookstore, amazon.com, and barnesandnoble.com. Media Contact: Dr. Charles W. Grimsley, D.Min.